A convenient downtown location with plush bedding and an on-site restaurant and cafe make the non-smoking Westin San Diego an urbane urban retreat. The 25-story non-smoking Westin completed a $15-million renovation in 2014. It features 436 rooms with city or bay views. Each is equipped with Westin's signature Heavenly Beds refrigerators coffeemakers hairdryers irons work desk ergonomic desk chairs flat-panel TVs with cable and Wi-Fi (for a daily fee). Work out in the fitness room take a few laps in the outdoor pool or soak in the hot tub. A restaurant with bar a casual cafÃ© and a business center are on-site. Valet parking is available for an additional fee and the airport shuttle is free. 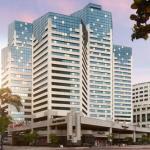 The Westin is in the heart of downtown San Diego two miles from San Diego International Airport and just a 10-minute walk from both the San Diego Convention Center and the waterfront's Broadway Pier. Seaport Village a 15-minute stroll from the hotel is full of charming shopping and restaurants. The hotel is just two blocks from the trolley station where you can catch a bus to Balboa Park's famous San Diego Zoo.